Duplicate bridge is played Monday afternoons from 12:30 pm to 4:00 pm. We are not ACBL members, therefore points cannot be collected. We do, however follow ABCL duplicate rules. Weekly results are posted in the Auroran and in the Seniors Newsletter as well as sent out to those players who have e-mail accounts. 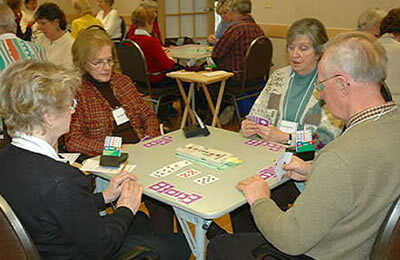 Bring your own partner or join 10 minutes early to draw partners and come and have a friendly, fun game of bridge. Bridge is played Wednesdays at 1:30 pm. Please join us for casual bridge.